Bodh Gaya is the most important Buddhist pilgrimage destination in the world. Located in the state of Bihar, India, it's here that Lord Buddha became enlightened during intense meditation under a Bodhi tree. The exact spot is now marked by the sprawling Mahabodhi temple complex. In this very serene place, monks from all over the world can be found sitting at the foot of an enormous carved Buddha statue, reading holy scriptures, and in deep contemplation. The town is also home to dozens of Buddhist monasteries, maintained by various Buddhist countries. An increasing number of people visit Bodh Gaya each year. Gaya airport, 12 kilometers (7 miles) away, has infrequent direct flights from Kolkata. If you're coming from other major Indian cities, the nearest airport is in Patna, 140 kilometers (87 miles) away. From Patna, it's a three to four-hour drive. Bodh Gaya can be easily reached by train. The nearest railway station is Gaya, which is well connected with Patna, Varanasi, New Delhi, Kolkata, Puri, and other places in Bihar. The journey from Patna by train is about two and a half hours. Bodh Gaya can also be visited as part of a pilgrimage to other Buddhist sites in India. Indian Railways operates a special Mahaparinirvan Express Buddhist Tourist Train. Another popular option is to travel to Bodh Gaya from Varanasi by car taking under six hours. The pilgrimage season starts in Bodh Gaya in September and reaches a peak in January. Ideally, the best time to visit weather-wise is between November and February. Avoid the monsoon season between June and September. The weather gets quite oppressive, followed by heavy rains. Summers, from March to May, are very hot. However, Bodh Gaya still attracts a large number of devotees during this time for Buddha Jayanti (Buddha's birthday) celebrations, held in late April or May. The elaborately carved Mahabodhi temple, Buddhism's holiest shrine, is the big attraction at Bodh Gaya. The temple was declared a UNESCO World Heritage Site in 2002. It's open from 5 a.m. to 9 p.m. daily, with chanting and meditation held at 5:30 a.m. and 6 p.m. The other temples and monasteries, built and maintained by various Buddhist countries, are also fascinating— particularly the different architectural styles. Opening hours are from 5 a.m. to noon and 2 p.m. to 6 p.m. Don't miss the very ornate Thai temple, shimmering with gold. The towering 80-foot sandstone and granite statue of Lord Buddha is a must-see. It took 12,000 stonemasons seven years to complete. Bodh Gaya also has an Archaeological Museum displaying an array of relics, scriptures, and ancient statues of Buddha. It is closed on Fridays. The sacred Dungeshwari Cave Temples (also known as Mahakala Caves), where Lord Buddha meditated for an extended period, are a short distance northeast of Bodh Gaya and worth visiting as well. 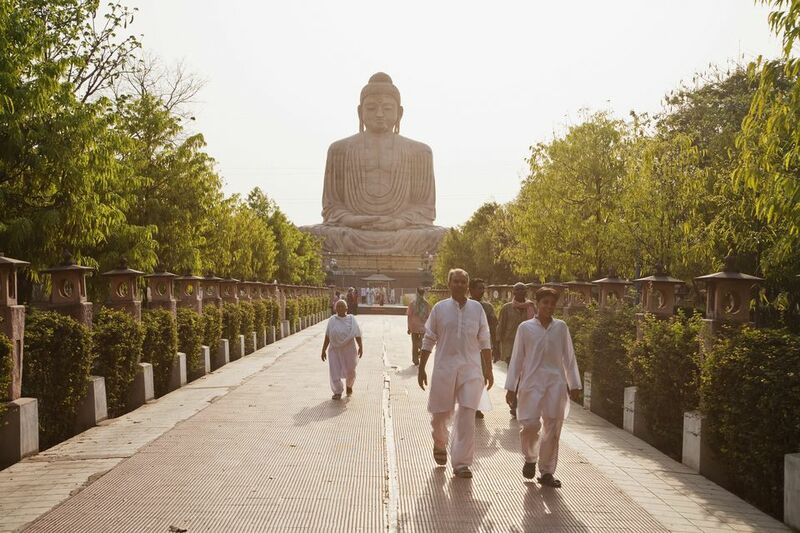 You'll find plenty of courses and retreats available in Bodh Gaya. The Root Institute for Wisdom Culture conducts introductory and intermediate meditation and philosophy courses, explained in the Tibetan Mahayana tradition, from October to March. Those interested in Vipassana Meditation can learn it at the Dhamma Bodhi Vipassana Center, with 10-day residential retreats starting on the 1st and 16th of every month. Some monasteries also offer Buddhism courses. The biggest festival in Bodh Gaya is Buddha Jayanti, held on a full moon in late April or May each year. The festival celebrates Lord Buddha's birthday. Other festivals in Bodh Gaya include the annual Buddha Mahotsava, a three-day celebration filled with cultural and religious activities. The Kagyu Monlam Chenmo and Nyingma Monlam Chenmo prayer festivals for world peace are held around January-February every year. The Maha Kala Puja is conducted at monasteries for several days before the new year, for purification and to remove obstacles. If you're on a strict budget, Bodh Gaya's monastery guesthouses are an inexpensive alternative to a hotel. The accommodations are basic but clean. It can be difficult to make advance bookings at these places though. You can try the well-maintained Bhutanese monastery (phone: 0631 2200710), which is quiet and has rooms in a garden setting. It's also possible to stay at the Root Institute, which is conveniently located near the Mahabodhi temple and offers meditation retreats. If you'd prefer to stay in a guesthouse, Kundan Bazaar Guest House and Tara Guest House are very popular with travelers. They're located in the quaint village of Bhagalpur, a five-minute bicycle ride from the center of Bodh Gaya. Backpackers will like A Bowl of Compassion on the outskirts of Bodh Gaya. Hotel Sakura House has a peaceful location in town and a view of the Mahabodhi temple from its rooftop. Hotel Bodhgaya Regency is the pick of the top-end hotels is not far from the Mahabodhi temple. Both vegetarian and non-vegetarian food is available, and there's a wide range of cuisine from Thai to Continental. Be Happy Cafe caters to western tastes. It has decent coffee and cakes, although some people think it's overrated and overpriced. Nirvana the Veg Cafe is popular opposite the Thai temple. Try the Tibetan Om Cafe for tasty Tibetan food. The makeshift tented restaurants that line the roadside during the tourist season are cheap places to eat. A side trip to Rajgir, where Lord Buddha spent much of his life teaching his disciples, is recommended. It's located about 75 kilometers (46 miles) from Bodh Gaya and can be reached by bus or taxi. There, you'll be able to visit Gridhakuta (also known as Vulture's Peak), where the Buddha used to meditate and preach. You can take the aerial tramway/cable car up to the top, for great views. The extensive ruins of ancient Nalanda University, a significant center for Buddhist learning, are also nearby. Electricity supply can be erratic at Bodh Gaya, so it's a good idea to carry a flashlight with you. It is traditional to take off your shoes before entering the inner parts of the main Mahabodhi Temple complex, as well as any of the monasteries around the area. Wearing loose-fitting respectful clothing and simple sandals is recommended. The town isn't very big and can be explored on foot or by bicycle.